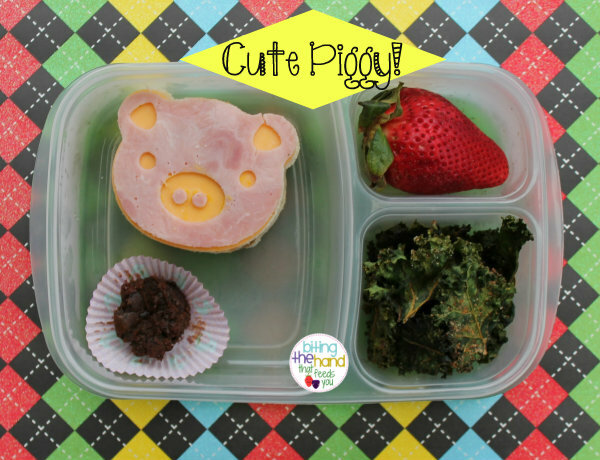 Biting The Hand That Feeds You: Easy and Healthy School Lunches Made Fun! 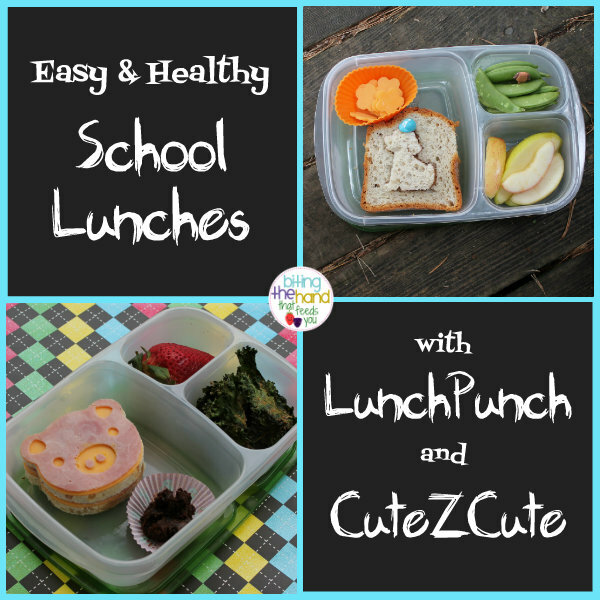 Easy and Healthy School Lunches Made Fun! Both of these lunches were quick and easy to make, and are balanced with all five food groups. 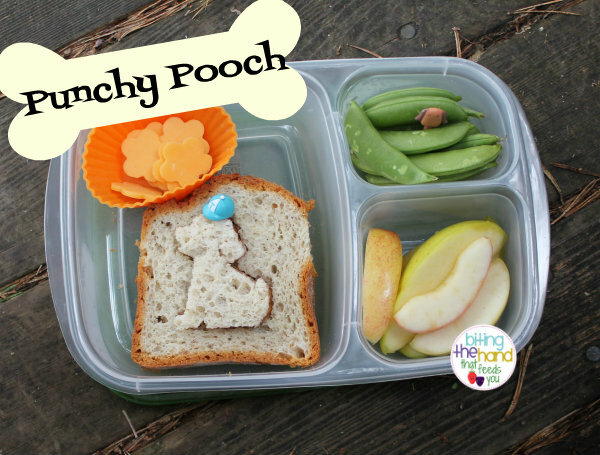 Packed in our EasyLunchboxes, since they're quick and easy to use! Wednesday, 3/20/13 - I needed something quick to make for Z's Wednesday lunch, since I had spent all evening trying to make something to bring for my turn at snack at Baby's preschool, and Hubby was out of town all that week. When I'm stumped for ideas or need something fast, one of the first tools I turn to is my CuteZCute cutter set. Same head outline, but four different animal faces to choose from. And you can do fancy things with various little cutouts from the different facial features. But not when you're strapped for time! So I cut two bread heads (and saved the scraps in a baggie in the fridge to make French Toast Casserole Muffins! Yum!) and two ham heads, and two cheese heads. Since I was making a ham sandwich, and I love irony, I opted for the piggy face cutter, so punched the features out from a slice of ham. Then I used thin layers of mustard to glue one ham and cheese on the inside, and one cheese and the cut ham on the outside. And little dabs of mustard to glue on the nostrils. Luckily, she looooves mustard! I totally flubbed my attempt at gluten-free, rice-free, vegan Chocolate Beet Cupcakes, but they tasted okay, so I went with it, and put one in her lunch. Monday, 3/11/13 - Since gluten-free bread doesn't rise as well as wheat bread, it's made in smaller loaves. Which means my beloved collection of Lunch Punch cutters are fairly useless, until I can figure out a way to bake my own and make it large enough. But the dog house cutter from the Lunch Punch animal set would work, provided I didn't care about it looking like an actual dog house. Yay! In hindsight, I wish I'd cut off the crusts first, since I could have made it a little house-shaped, and then the crusts wouldn't have gone to waste. One tip for success when using cutters on bread is to cut out each slice separately and adding fillings after. Or you can cut the top slice separately, before bringing it and the cutter over the rest of the sandwich and punching through that too. Work on a flat surface like a countertop or cutting board, not a plate. And there are tips out there about warming the bread in the microwave first to soften it, but I don't know the details, as I'm far too lazy to go to that much trouble. To help the little dog stand out better, I pushed it up a bit, and added a jaunty baseball cap pick. I used a mini flower cutter on a slice of cheddar cheese, to make it more fun, and added a dog head pick to the organic sugar snap peas.